Tululusia waterfalls Arusha national park, (behind viewer) a view of the river downstream from it . Tululusia waterfalls of Arusha national park, view of the river from a small bridge further downstream from it . A tall and beautiful waterfall that is located deep inside Arusha national park and on the slopes of mount Meru. With an approximate height of about 28 metres, the height of the falls is so large that it actually is dangerous to stand underneath it, constantly giving off a gushing sound, large enough to drown all others in its immediate vicinity. 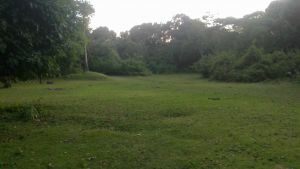 Over the years the river has slowly eroded through a hill made of soft volcanic soil and stones, slowly creeping to the centre and increasing its height. As a result the falls now sit inside an enclosure much like a cave open on one end (the entrance) and the river on the other, with the walls of the cave now providing nesting sites for red-winged starlings. The actual river is not that large but the sheer height of the drop is enough to fool anybody approaching it that it is so. The waterfall normally can be heard well before it is seen, usually about 100 metres away and at the base of it is a pool of water too small to be called a plunge pool, filled with smaller volcanic rocks and pebbles. 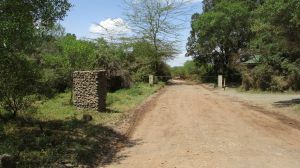 It normally requires a short walking tour to get there from Momela gate and it shares the same path as the hikers to the summit of mount Meru use, thus making it possible to visit it before the climb. At the time of writing, fees payable are a conservation fee of TSHS 10,000 for East African citizens or USD 45 for other nationals, along with a walking fee of about TSHS 5000 (E.A. citizens) or USD 20 (other nationals). Other fees may include vehicle entrance permit (if going by private vehicle) - for more information see the TANAPA website.What to do there?Hike to the place and enjoy the sights and sounds of the waterfall. The hike takes you through uwanja wa mbogo and across or along (depending on route) a small river that originates from the waterfall further upstream. 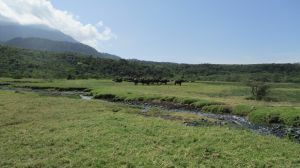 On the way there, you could get to see a lot of wildlife, including buffalo, warthogs, giraffe and even get the opportunity to take a picture with them in the background. The area next to the falls is truly an amazing environment to be in and although not comfortable enough for a picnic, there are many spots nearby that could do the job. 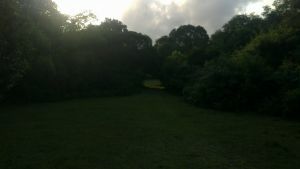 Other things you may see include flowers, smaller fig trees and several distinct plant species. Just remember to get an armed ranger from momela gate before you head up there. When done, you could either head up the mountain (if that was your original destination) or visit the other attractions in the park. Best time to visit?Any time not in the rainy season of march to july every year. It is possible to visit during these times, with the water at the falls increasing in volume; However, the unless you would like to get drenched or not be able to see the cloud covered peaks of mount Meru, this may not be the best time. 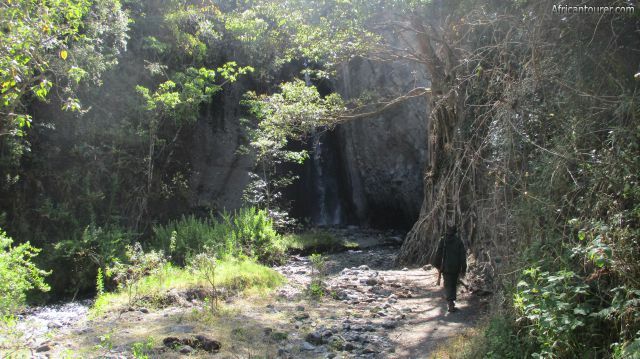 The Tululusia waterfalls are located deep within the Arusha national park and on the north eastern slopes of mount Meru. 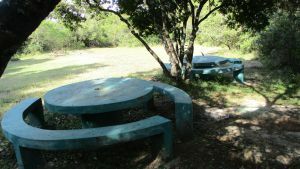 It is about a kilometres walk from Momela gate and about a similar distance from public campsites number one and two. For more information about its location, please see the map below (click to start). How to get there?First of all you would have to get to Momela gate, where they would check your permits and give you an armed ranger for protection during the walk, that would also serve as your guide. This can only be done by a vehicle, either a rental, private or a tours and travel one. Most of the roads inside the park are all seasons dirt roads, so you don't have to worry much about the type of vehicle. There are public buses that go through the area from Arusha bus terminal but we are not sure about whether this mode of transport into the park is allowed for hikers, so please contact TANAPA for more information. 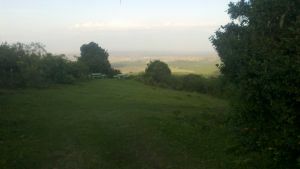 Once at Momela gate, a short walking safari should get you there in about half an hour. Are you associated with Tululusia waterfall? Contact us to improve this page or create another page for your business.